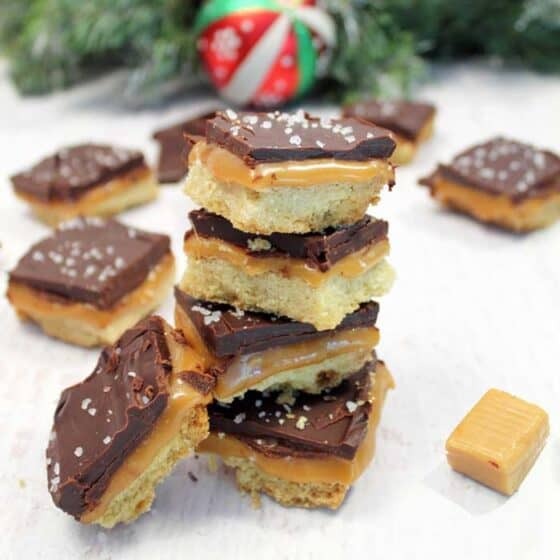 Shortcut Millionaire Cookie Bars have all the buttery shortbread, creamy caramel & rich chocolate you expect from millionaire bars but without the hassle. Preheat oven to 325 degrees. Butter the bottom and sides of a 9x13-inch baking pan. Cut a piece of parchment paper to cover the bottom and come up the sides of the baking dish to make it easier to lift out after it has been cooked. Butter the parchment paper as well. In a large bowl of an electric mixer, stir together flour and sugar. Add butter and vanilla extract and beat until it begins to resemble dough. I like to mix it well and then squeeze it with my hands until it is well blended and sticks together. Pat into a flat layer in the bottom of the baking pan. Bake for 35 minutes, rotating ¼ turn halfway through cooking time. Remove and let cool on wire rack. In a large microwave-proof measuring cup or bowl, heat caramels and cream in 30-second increments, stirring between each increment, until caramels are melted and mixture is smooth. It takes about 2-3 minutes. Place in refrigerator for about 30 minutes or until caramel has set. In a large microwave-proof measuring cup or bowl, mix chocolate and cream together and heat in microwave in 30 second increments, stirring between each increment, until chocolate has melted and mixture is smooth. It takes about 1-1/2 minutes. Use parchment paper to lift cookies out of pan and onto a cutting board. Immediately cut into 1-1/2" x 2" bars with a very sharp knife. Store in refrigerator.